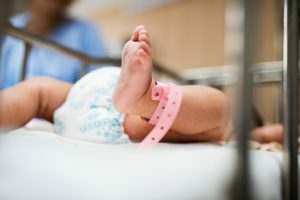 It goes without saying that hospitals and other healthcare organisations have substantial energy demands. From lighting, heating, catering and security, through to life-critical facilities and devices. Power outages are not acceptable. Therefore, perhaps more than in any other industry, the healthcare sector demands the highest levels of dependable continuous power and that’s why ambulance services, operating theatres, laboratories and hospitals turn to shentongroup. 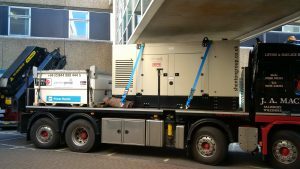 This hospital has 4 of its own on-site generators, two of which are running 24/7, with two on standby. 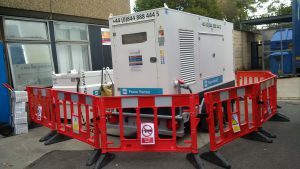 When our client’s 4 on-site generators are taken off-line to be tested and serviced ourselves, shentongroup provides the site with 4 rental generators, with no break in continuous power. Having guaranteed reliable power throughout blackout testing for their generators for the last 6 years, shentongroup continues to be a trusted provider that our client turns to time and time again. Like all standby generators, our client’s 4 on-site generators require regular maintenance and support to ensure their optimal performance, for when they are needed the most. s will be picked up early and rectified well in advance of them causing any operational problems. Our rental generators provide our clients with dependable power protection at an affordable, competitive price. As is the case with all shentongroup Power Rental contracts, with regular on-site service and maintenance, plus 24/7 technical support. 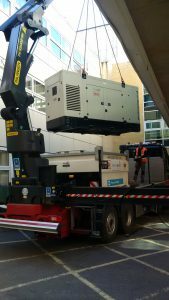 This hospital can confidently go about its day-to-day business without the concerns surrounding mains power failures. To discuss your organisation’s continuous power in more detail, click here to speak to a member of the UK’s leading technical experts in Standby Power, Uninterruptible Power Supplier and Combined Heat & Power Systems. If you’d like to request a detailed site survey, then click here.